Now he’s a defensive end, a position that could mean even more trouble for opposing quarterbacks. His only duties: set the edge to stop the run or get to the quarterback, something Jones does with a vengeance. There’s a viral video of Jones wreaking severe damage on a blocking sled earlier in camp. “Just too powerful” he explained. But there’s more than power to the 6-foot-5, 265-pound Jones’ game. In the 2017 season, Jones lived up to those big numbers. Not only did he lead the league in sacks but also in tackles for loss with 28, well ahead of the second-best performance, 21 by Houston’s Jadeveon Clowney. 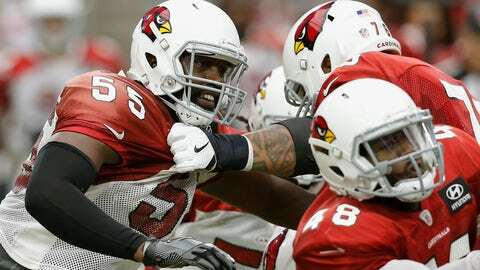 With Arians’ retirement and the arrival of Wilks, Jones is moving back to the 4-3 defense that he played with the Patriots. It means going back to a three-point stance instead of standing up as an outside linebacker. Notes: Wilks said LB an MRI on LB Deone Bucannon’s knee showed no structural damage and the player’s availability in training camp would be evaluated “day to day.” Bucannon banged his knee against WR Brice Butler’s helmet on Thursday. … Several thousand people attended the team’s “Red and White Practice” on Saturday.